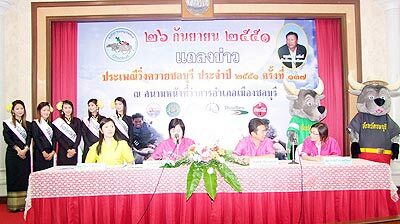 Choice water buffaloes are pawing the ground once again for the 137th Chonburi Buffalo Races to be galloped on the auspicious days of October 12 and 13. This race, believed to be unique in Thailand and the world, is this year again being organized by the Chonburi Provincial Administration and the Tourism Authority of Thailand, to be run precisely on the 14th night of the waxing moon in the 11th lunar month. Two races will be run on the grounds in front of both the Chonburi City Hall and the Muang Chonburi Hall, accompanied by other festival activities such as a traditional Thai sports competition, a singing contest, a parade of traditional carts, normally drawn in the villages by water buffaloes, and Miss Village beauty contests. But large and impatient on center ground will be the beloved work-horse water buffaloes themselves that will receive deserved attention and accolades. The racing buffaloes, no doubt training up earnestly now in the rice fields, will be divided into 3 categories: super junior buffalo, junior buffalo and large buffalo. Apart from finding the speediest thoroughbred, competitions will also sort out the most beautifull-decorated buffalo, the funniest buffalo and the best buffalo breed. For more information, please contact Chonburi Municipality at 038-283958 ext 138 or the Chonburi Information Center at 038- 279448.
went there last year. was very hot day. after the buffalo false starts a bunch of farmers will chase after it, circle it with their arms stretched wide (i guess to give the impression they are big), then a brave soul will try to grab the rope and lead the buffalo back to the starting gates. entertaining stuff. for about 20 minutes. Darn, I missed it again. I always seem to miss the Monkey festival in Lopburi and this one. ^ Well in November you've got the buffalo and longboat races at Mabprachan Reservoir. I thought this refered to the nightly Pattaya event of seeing which bargirl could empty their buffalo's bank account first? I would imagine the longboats would always win. The Mabprachan races are on the 22nd and 23rd of November for those interested.